Detailed map of Tiege, ca. 1925. House in Tiege (now Tuja, Poland). Source: Vorlaubenhäuser im Weichselwerder, Das Land Des Deutschen Orden: Ostpreussen-Westpreussen-Memelland. Tiege (also known as Thuya and Tuga; now known as Tuja; coordinates: 54.179, 19.0614 [54° 10′ 44″ N, 19° 3′ 41″ E]; population in 1905, 494; in 2012, 190) is located approximately 6 kilometres (4 miles) southwest of Nowy Dwór Gdański (Tiegenhof), 16 km (10 mi.) north of Malbork (Marienburg), 21 km (13 mi.) west of Elbląg (Elbing), and 35 km (22 mi.) southeast of the regional capital Gdańsk (Danzig). It was situated southeast of Ladekopp, southwest of Rückenau, northwest of Marienau, northeast of Mierau, and east of Bröske. Tiege was first mentioned in historical documents in 1318 (Thuya) and received privileges in 1345. Until 1772 Tiege was part of the Kingdom of Poland. The First Partition of Poland in 1772 resulted in the creation of a new province in 1773, called West Prussia, in which Tiege was located. Tiege was situated in the district (Kreis) of Marienburg until the establishment of the Free City of Danzig in 1920. The village came under the control of Nazi Germany during World War II until February 1945, when it was occupied by Soviet forces and returned to Poland. Today Tiege is a village in the administrative district of Gmina Nowy Dwór Gdański, within Nowy Dwór Gdański County, Pomeranian Voivodeship. In 1727, 28 Mennonites lived in the village; the 1776 Prussian census lists 16 Mennonite families living in Tiege with the following surnames: Borckmann, Claassen, Dack, Diderich, Epp, Friesen, Froes, Funck, Gerbrand, Penner, Reimer, Teows, and Wieb. 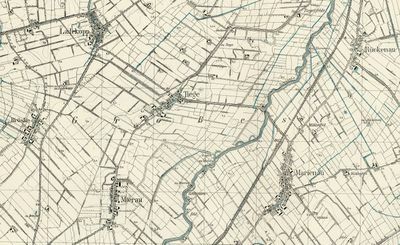 In 1820, the combined villages of Tiege and Tiegefelde had 431 residents, including 86 Mennonites. In 1936, the village was inhabited by 18 families: Driedger, Ens, Hinz, Heidebrecht, Jansson, Janzen, Klaassen, Mekelburger, Neufeld, Penner, Quiring, Ran, van Riesen, Thiesen, Wiebe, and Wiens, among others. The Flemish Mennonites of Tiege were members of the Ladekopp Mennonite Church while the Frisian Mennonites were members of the Orlofferfelde Mennonite Church. Stowarzyszenie Konserwatorów Zabytków. "Tuja." Catalogue of Monuments of Dutch Colonization in Poland. 2005. Web. 25 November 2012. http://holland.org.pl/art.php?kat=obiekt&id=465&lang=en. Wikipedia. "Tuja, Nowy Dwór Gdański County." 8 March 2014. Web. 22 August 2014. http://en.wikipedia.org/wiki/Tuja,_Nowy_Dw%C3%B3r_Gda%C5%84ski_County. Wolf, Hans-Jürgen. "Familienforschung in Westpreußen." Web. 25 November 2012. http://www.westpreussen.de/cms/ct/ortsverzeichnis/details.php?ID=6509. Thiessen, Richard D. "Tiege (Pomeranian Voivodeship, Poland)." Global Anabaptist Mennonite Encyclopedia Online. August 2014. Web. 26 Apr 2019. http://gameo.org/index.php?title=Tiege_(Pomeranian_Voivodeship,_Poland)&oldid=126330. Thiessen, Richard D. (August 2014). Tiege (Pomeranian Voivodeship, Poland). Global Anabaptist Mennonite Encyclopedia Online. Retrieved 26 April 2019, from http://gameo.org/index.php?title=Tiege_(Pomeranian_Voivodeship,_Poland)&oldid=126330. This page was last modified on 21 October 2014, at 18:00.